SSRS Error 3: The configuration file contains an element that is not valid. The ReportServerUrl element is not a configuration file element. 4. After completing the Reporting services set-up, I have got all necessary green mark on the configuration manager window. Then I tried to access the Reports url http://localhost/reports and I have got the following error message! To fix this issue, just follow these steps, the same modification of the “RSWebApplication.config” will solve this issue too. SSRS Error 2: The attempt to connect to the report server failed. Check your connection information and that the report server is a compatible version. Step 2: Check whether <ReportServerUrl> and <ReportServerVirtualDirectory> elements having any values. Step 3: If <ReportServerUrl> tag’s element is empty then add the full url of the ReportServer (Not Reports). Please note: I have tried with server IP, Server Name and localhost, all are working fine for me and if you want to use server name and it ‘s using different port number other than 80, then the ReportServerUrl should be: http://servername:portnumber/ReportServer. Step 4: If <ReportServerVirtualDirectory> tag’s element has any value (for me ReportServer is there, which was added to fix the previous error) then just delete it and leave it empty. I am installing a 3rd party Auditing Software for our SharePoint 2007 farm and it needs SQL Reporting Services (SSRS) to generates reports. When I was configuring the SSRS 2005 (It is already installed but not configured) on our production server which is having Windows 2008 R2 OS and IIS 7.5. After completing the Reporting services set-up, I have got all necessary green mark on the configuration manager window. Then I tried to access the Report server http://localhost/reportservers (Normally ReportServer but I configured as ReportServers, you can check the step-bi-step configuration here) and I have got the following page! Great!! After this I tried to access the Reports url http://localhost/reports and I have got the following wired error message! Step 3: If so, just add the ReportServer value in the ReportServerVirtualDirectory tag. That’s all, we are safe and this problem solved, but you might be getting an other error message at this point (I have resolved this here). I don’t really know why this element is missing, while configuring “Web Service Identity” it should be added in the config file. Anyway this is a known issue but I wanted to keep for my future reference and this UI steps would save some time of yours too. Change the file access method to “Process Account”. 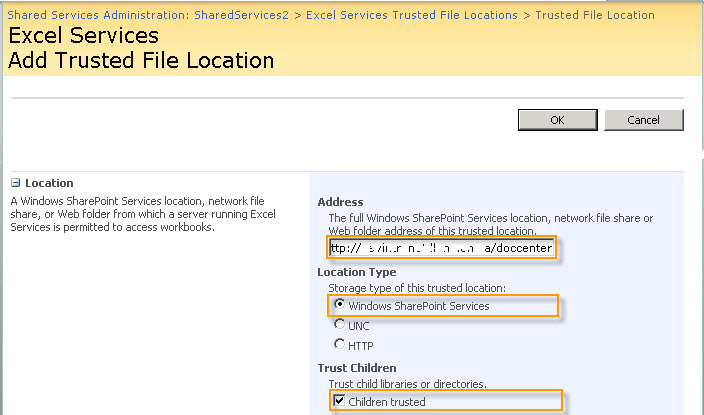 Go to the “Shared Services” under “Excel Services Settings” click the ”Trusted file locations”. You will be navigating to the “Excel Services Trusted File Locations“ page. Then click “Add Trusted File Location”. There are so many ways to get the user details form AD (Active directory), but I wanted to get the current user’s OU (Organizational Unit) from Active directory. There is no any direct method to get the OU (Actually I could not find anything on the web, if anyone get an easy way to find-out please let me know). I am currently developing a Custom Search for SharePoint 2007 and according to the OU, I want to display the search results. Here is the method I have created and most of the comments I have put in the code itself. I used Asp.net and C#. If you want to get the current user’s OU then you can call this method in the Page_Load event.